Summary: This photograph shows inmates, Amos Phillips, prisoner #9223 and George Lyon, prisoner #8736. Amos Phillips was received at the Kansas State Penitentiary on February 19, 1900 from Bourbon County, Kansas for murder. 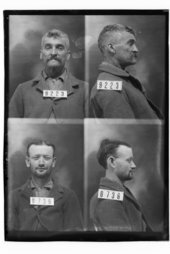 Inmate George Lyon was received at the penitentiary on December 1, 1898 from Douglas County, Kansas for larceny. Varient spelling of his surnmae includes Lyons.